If you have battled with depression and oppression throughout your life, it no longer can rule over you. This is your word and promise to be set free. “Arise shine for your light has come and the glory of the Lord has risen upon you.” This is a word to you today that goes far deeper than you may realize. Can you be free from depression and oppression? Yes! Arise (rise up from oppression and depression) for your light (illumination, happiness and morning) has come. And the glory (His honor, majesty and wealth) have risen upon you! SEE ALSO: Your Day of Restoration is Here! 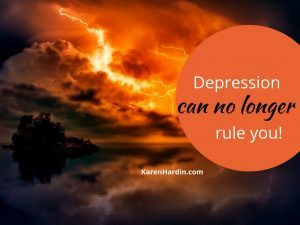 Depression and Oppression can no longer rule you! Are you battling depression and oppression? Your light, illumination, happiness and morning/new day, have come! His glory, majesty and wealth have risen upon you! That is His inheritance to you today. You are set free. No matter what has been in your family line. No matter what you have battled. His glory is risen upon you. This is the dawn of a new day for freedom. Embrace it. Walk in it. Be free! Sign up for free email updates! You’ll receive encouraging words and prophetic insights whenever new content is posted. Don’t worry; we hate spam and will never share your info.